Order Your 2017 LLSA Study Guide Today! 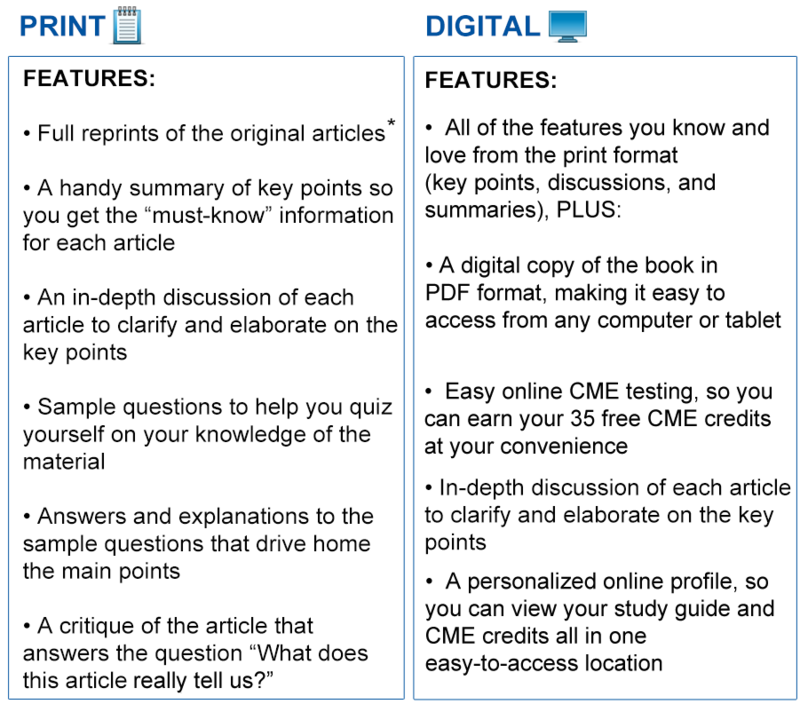 You'll Get Full Reprints* Of The Original Articles And Gain All The Knowledge You Need, Plus Earn Free CME. The 2017 LLSA Study Guide is available for $219. 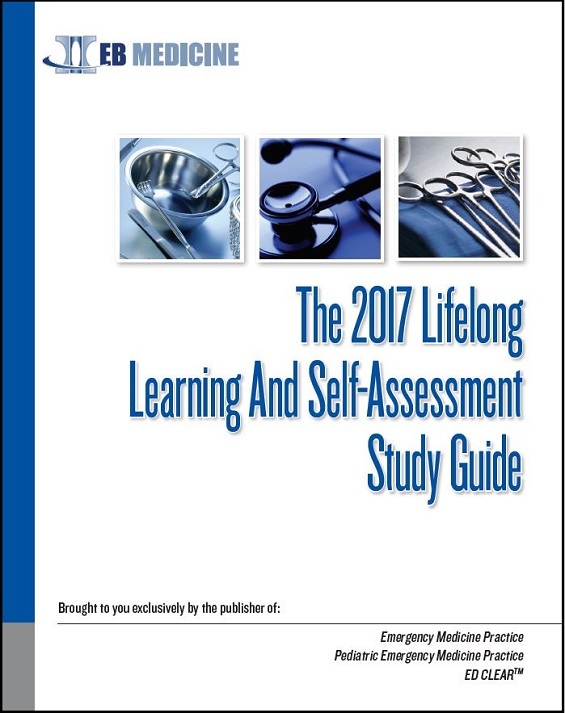 EB Medicine's 2017 LLSA Study Guide is designed exclusively to give you the freedom to prepare for the ABEM exam in print or online--while helping you gain practical knowledge of the material. For each of the chosen readings, you receive print and digital tools that include the materials you need to ace the exam. Both versions include full reprints* of the articles, a summary and in-depth discussion of each article, sample questions and answers, and a critique of the article. Both print and digital formats will be included with your order (unless you order the online-only edition). Plus, you earn 35 AMA PRA Category 1 CreditsTM / ACEP Category I Credits at no extra charge. With the 2017 LLSA Study Guide, you will have the ability to study the material to pass the exam both in print and digital formats. The traditional spiral-bound book, which lays flat for study and is easily portable. If you are not satisfied for any reason, simply call to receive a full refund immediately. No questions asked. The American Board of Emergency Medicine's Continuous Certification (ConCert) program requires the reading of up to 20 designated articles each year. In order to maintain board certification, emergency physicians must complete the annual Lifelong Learning and Self-Assessment (LLSA) test on the ABEM website based upon the content of these articles. A new LLSA test and associated reading list will be developed each year. You have up to three years to take each test. The 2017 LLSA exam will be available from April 2017 until April 2020. * Due to copyright restrictions, a reprint of article 5 and one table in article 10 are not included in the 2017 LLSA Study Guide. This is a nice format for LLSA review and testing and CME. Good reference for quick review! Good course! I now have a better understanding of the oral anticoagulants that will improve drug choice in a variety of patients. This course is an absolute necessity in dealing and answering the correct ABEM LLSA questions. This course will allow me to better assess my patients in the ED and initiate interventions sooner in their ED course. I will encourage my colleagues to purchase and participate in evidence-based practice conversations to improve care. EXCELLENT program!